Watched by millions of TV viewers, the historic Moon landing occurred on 20 July 1969 when the Apollo 11 mission touched down on lunar soil of the southern Sea of Tranquility. The Lunar Module (LM), christened Eagle, spent 21.5 hours on the Moon’s surface, while the Command Module (CM) named Columbia orbited above. 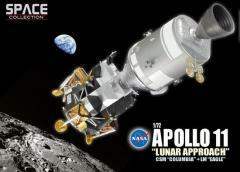 Space Series new item 50375 features the Eagle LM still coupled to the Columbia CM on its approach to the Moon. The spacecraft modules possess accurate details. Having the two modules connected like this makes for an impressive sight when they’re exhibited on the integral display stand. The kit also makes for an interesting education lesson, allowing modelers to understand more about this milestone event. The Apollo 11 mission was indeed “one small step for man, one giant leap for mankind.” And now Dragon has added one more significant step in the Space series!